if you would like higher quality files. 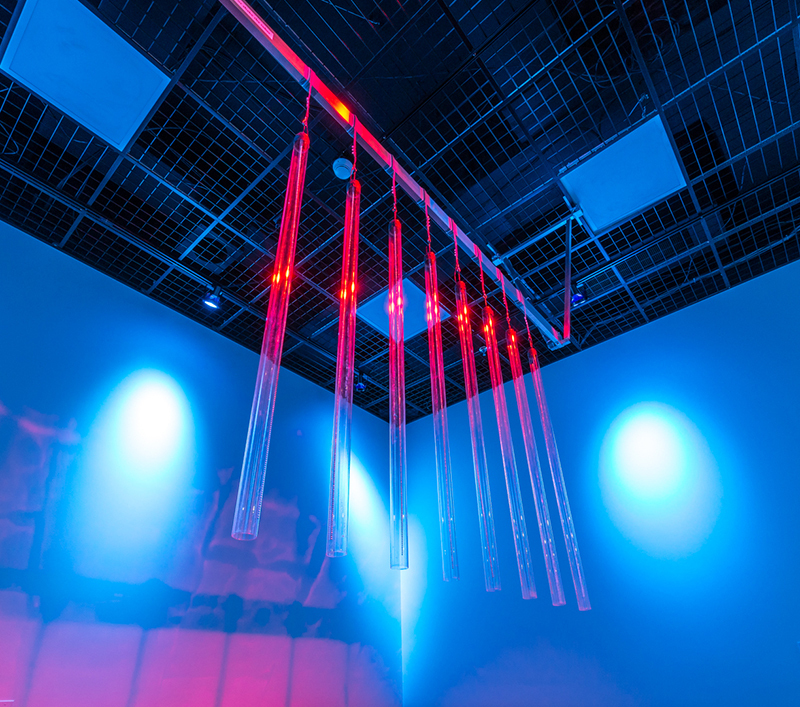 Hanging acrylic tubes containing bead-chain generate acoustic impulses that trigger and control the synthetic sounds present in this piece. Each tube has a contact microphone embedded in its cap, and when a tube is tapped or shaken the vibrations are transmitted to a computer running custom signal processing software. Several types of sound generating algorithms are employed, including granulation, wavelet synthesis, rotating variable delay, formant synthesis, spectral reverb, and additive synthesis. The contact microphones afford expressive control of these sounds by providing a wide range of input sounds that are mapped directly to various parameters of the synthesis algorithms. Cooper Baker is a sound artist living in San Diego, California. He regularly plays experimental music at venues along the west coast, and his work has been exhibited, performed, and featured in publications throughout the United States and abroad. Originally from Los Angeles, he moved to San Diego to attend the University of California San Diego in pursuit of a computer music Ph.D. where he is currently studying with Miller Puckette and Tom Erbe. Prior to enrollment at UCSD he was a music faculty member at California Institute of the Arts where he also received his MFA in experimental composition and finished his BFA in music technology. While at CalArts he refined his artistic practice by incorporating new and experimental electronic media in his artwork and music, under the guidance of Morton Subotnick, Mark Trayle, and Barry Schrader.